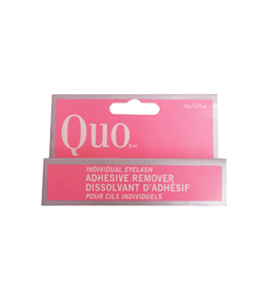 Quo brand false eyelashes glue remover. For individual eyelash or strip lashes. Designed to help dissolve false eyelashes glue safely. Ingredients are branched chain hydrocarbons, isopropyl myristate, cyclomethicone, tocopheryl acetate, cholecalciferol, aloe barbadensis, mineral oil, sambucus nigra, arnica montana, althea officinalis, cucumis sativus, hedera helix, and comfrey.